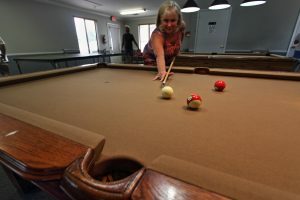 Whatever you’re looking for in a retirement community in Central Florida, you’ll almost certainly find it at Bear Creek. Do you enjoy long walks on the beach? You can get to some of the world’s most acclaimed beaches within a few minutes by car. Do you like to play golf? There’s a golf course that’s open to the public right next door. Are you an avid angler or boater? Charter fishing services and boating opportunities abound near Bear Creek’s location only a few miles from the Atlantic Ocean. With so much to offer, you might think that this retirement community is out of your price range. But the best thing about Bear Creek is the way we make an active Central Florida lifestyle affordable for many people on a retirement budget: We provide safe, comfortable housing in high-quality manufactured homes that typically cost significantly less than the site-built homes you’d find in a similar resort-style retirement community. What’s more, your low monthly home site lease payment will cover on-site professional community management, maintenance of the common areas, and regular lawn mowing services for your home. For more information about the Bear Creek retirement community and the advantages of living in this part of Central Florida, contact us today. We’ll be happy to arrange a tour for you when you’re in the area.